After reading our previous blogs on Attending Webinars and Conducting Webinars, one of our office space for rent tenants suggested that we make another blog with tips that he has learned over the past few years as a webinar presenter. He also pointed out to us a great blog he read last year from Adobe called Six Tips for A New Webinar Presenter that he said would have helped him when he was starting out conducting webinars. The first step in having a more successful webinar is planning your webinar. The better planned your webinar is, the better chances you have of having a more successful webinar. Two big parts of your planning should be to plan your presentation design and to plan the engagement or your audience. Plan your presentation design. Don’t just plan your content or material, plan how you are going to present it to your audience and when you are going to transition your slides. You may even consider using an alternative to PowerPoint slides, like using Adobe flash, Prezi software or an online mind map like iMindMap. Plan the engagement of your audience. If you are conducting an interactive webinar, schedule points in your presentation to ask the audience a question every 7 to 12 minutes. Asking direct questions that most of your audience can relate to on the topic you are presenting, and what they expect to gain from your training. Frequent engagement will keep your audience’s attention and give you a sense of how well the presentation is going. As well as the content, design and audience engagement of your your webinar, you also have to take in the technical considerations of your presentation. Here are just a few. Avoid slideshow animation. While animations and transitions between slides such as dissolve in, fly out or fades look great in slide programs like PowerPoint offline, they can often be problematic in some webinar platforms or for users with slower connections. Providing hyperlinks. Not all webinar hosting platforms allow you to make links in your webinar presentation. Users may sometimes may have problems with them because of browser issues or experience with the webinar platform. 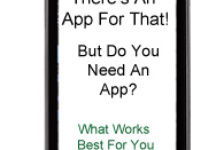 If not programmed properly, a hyperlink may take an audience member away from your presentation. If you want participants to actually follow a link, you are best served by placing the link in the text chat window with a _blank modifier, so that the ‘open in a new window’ does not interfere with the way the audience is interacting with your presentation. If you are planning to share links with your webinar audience for them to follow while still engaged with your presentation, have a text file handy with the links in it, so you can just copy and paste the link from the text file into the chat window. Take a practice run. To avoid potential technical or content problems from being encountered during the webinar you are conducting, you should take a practice run before you go live. Having a practice run for each webinar you do is very important, even if you have done it before for a different audience. Be sure to test your equipment and the webinar sharing platform you will be utilizing. 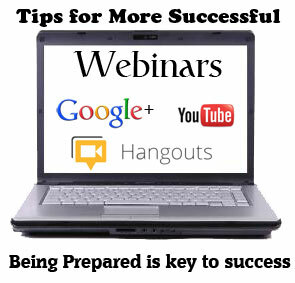 The second step for having a more successful webinar is the to be prepared for what will happen during the webinar and know what does what. This means delegating responsibilities to producers/moderators and preparing your audience before you begin your presentation by giving participants clear directions. You also have to be prepared to have the right audio equipment and ensure that participants know what equipment they will need. Delegate producer/moderator duties. Have a producer or moderator troubleshoot technical problems that webinar users are having, so that you can carry on with the presentation for the majority of users who are not experiencing technical problems. Your producer can also help you select the questions that you should handle from the chat. Give participants clear directions. Before beginning your presentation, make sure you provide clear directions of how the webinar platform works and how participants can use the various features that you plan to use, such as the chat or feedback box. The most important direction you can give your participants is how you want them to ask questions or how to raise their virtual hand. Be aware of audio echo. Have the right equipment is very important, especially if you are allowing audio feedback from participants. Do NOT use a stand-alone microphone and your computer speakers, as this will cause an echo effect or a lag when you are interacting with participants. You should instruct participants who are going to be interacting with audio questions or responses that they should use a headset with a microphone instead of their speakers and a stand-alone microphone – as the audio coming from their speakers could create a feedback loop into their microphone and confuse them. If you are planning to share your entire desktop with webinar participants, be sure to turn off any instant-messaging applications, updates, social networking plug-ins or other notification software or other programs that may interrupt or distract you or your participants from the webinar. Encourage your participants to turn off such notifications, so they too will not be distracted from viewing your presentation. Be sure to turn off any streaming media applications or automated software updates that may take up speed or bandwidth. Also consider turning off unnecessary background processes or resource-intensive applications that may be taxing on your computer processor. Remove background images and set your desktop display to a neutral background. Also, be sure to change your display settings to a mid-range resolution such as 1024 x 768. Having mid-range screen resolution will improve the display for attendees who may have lower screen settings than you. Remove all icons from your desktop. You do not want your audience to be distracted by looking at them or other installed programs on your desktop. Having a clean log-in on your computer when conducting webinars is a great way to ensure that you do not have to clean your desktop each time you conduct a webinar. Lastly, we still have to stress…..location, location, location. Even with all the planning in place, choosing the right location to physically do your webinar is very important. Having a quiet location without outside noises or interruptions will ensure that your webinar is not sidetracked, or you do not become distracted by telephone calls or unexpected guests. Our office space tenant who conducts frequent webinars will often book one of the quiet or less used boardrooms on the 19th floor and post a sign that says “Webinar In Progress, Do Not Disturb” so that no one knocks on the door or inadvertently walks in. Day 17 of the Vancouver Olympic Games ended with a bang and not just the fireworks at the closing ceremonies.